Kalindi Didi, Srila Gurudev and Sanatani Didi, Vidura Krishna Prabhu and Isthadevika Didi at the Seva Ashram. 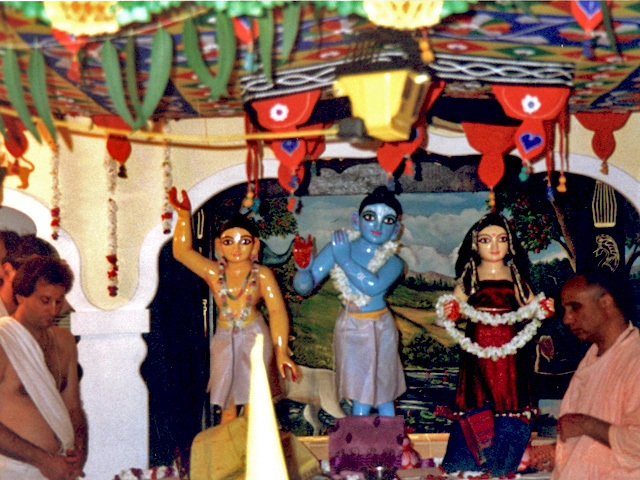 At the time of the installation of Their Lordships in 1996, there was a sliding door between the kitchen and the temple room. The temple room and all the surrounding rooms were packed full with so many devotees, but being in the kitchen we could see Srila Govinda Maharaj, Sripad Janardan Maharaj, Sripad Sagar Maharaj, Sripad Rshabdev Prabhu, Sripad Ramai Prabhu and other devotees reciting prayers and making sure everything was ready and perfect. 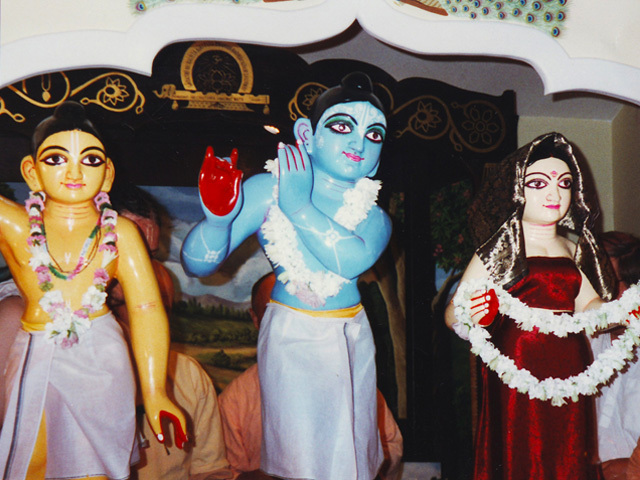 Sri Sri Guru Gauranga Gandharvika Giridhari ki jay! installation. Quickly Sita Devi Dasi, without any hesitation, took all her jewelry off and offered it to the Lordships, and they put that jewelry on the Deities. I felt so inspired seeing Sita’s spontaneous offering, that I also took my jewelry off and passed it forward. Soon Jivana Devi, Diksavati Devi and all the women in the room took all their jewelry off and Sureshwari Devi gave her wedding ring and passed it, hand by hand, to the Altar. It was very special because it was right at that moment that you had the chance to offer it. You couldn’t just go home and get something. 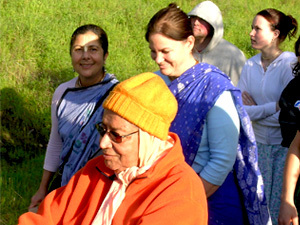 It was yet one more example of Srila Gurudev’s complete mercy in allowing us an opportunity to serve him. had been left over from the morning and lunch Prasadam, even though we made a beautiful offering, we offered only small bowls of everything to Their Lordships. When Srila Gurudev saw the plate he was very sad and said he would fast until Mahaprabhu had enough rice! Ramai Prabhu and I were devastated! What had I done? I felt not only completely ignorant, but the total offender that I am, and it was too late to fix it! Not wanting to make any more offenses, Ramai Prabhu and I went and asked Srila Gurudev for an exact list of what should be offered in every offering. Srila Gurudev loved talking about Prasadam, so we were very lucky to get a detailed explanation of what to offer each day and also on special feast days! Our standard, until that day, wasn’t to offer a lot of rice. But by the time of the night offering it was explained to us that at our Math in India the Deities are offered a big mountain of rice and the rest of the foodstuff are offered in smaller bowls. That was also when we learned that the rice and the fries go on one plate and everything else in bowls on a separate plate. Previously we had three plates; one for each of Their Lordships. However, we learned that actually there are only two plates. 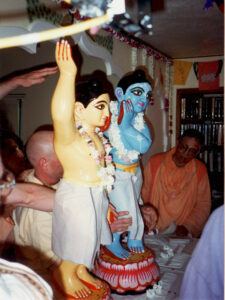 One is for Sriman Mahaprabhu and one for Sri Giridhari. This is because Srimati Radharani takes Sri Giridhari’s remnants! Another example of how, through the mercy of our Srila Gurudev, we get a glimpse into these most charming pastimes of the Lord and His pure Devotee. For the night offering we made a huge, opulent plate with a mountain of rice molded with a curved pot lid, and with over 20 different preparations. At the time Srila Gurudev and the sannyasis would eat at a long table in the temple room. Before serving out, I went in there and asked Srila Gurudev to please come and see the offering. As always, he was very gracious and said “No Didi it is not necessary, I am sure it is fine”. But I was so upset from earlier and pretty much begged him to come and see! He let me take his arm and walk him to the altar and open the curtains up for him to look in. I will never forget his huge smile as he declared “Now Mahaprabhu has full Prasadam!” Ramai Prabhu and I shared a very big sigh of relief, as Srila Gurudev went back to his table and also took full Prasadam that day.